In my post about Wrestlemania 24, I called it my favorite live Wrestlemania experience. By contrast, I'd have to say 25 was my least favorite. 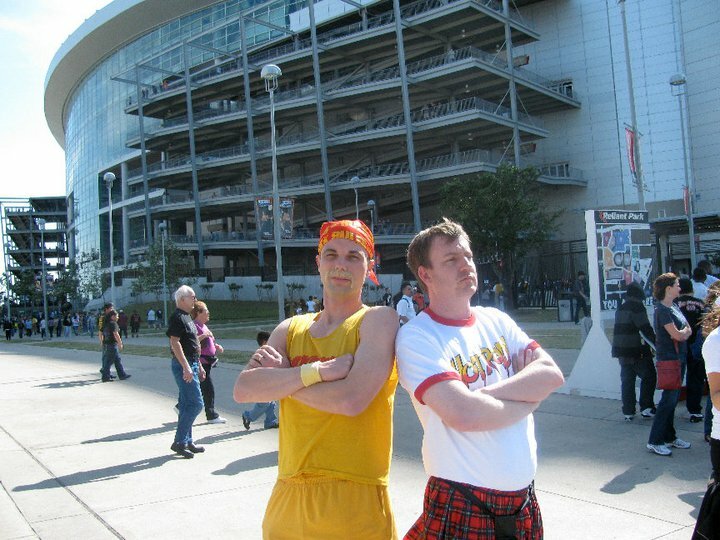 But keep in mind, anytime you're at Wrestlemania, it's a helluva good time. But for some reason, I left like the 25th installment of this historic show should have had more pizazz. Mania was main event by Triple H and Randy Orton. There are several reasons why I didn't enjoy this scenario, one of the biggest being that these two had wrestled countless times prior to this match. Not to mention they were in a three way match for the WWE title the year before with John Cena. Trips came out on top of this contest in one of the most lackluster main events in the history of the event. Maybe it's not Triple H and Orton's fault entirely. They were coming off the heels of one of the best Wrestlemania matches I've seen live, the Undertaker vs. Shawn Michaels. As I mentioned recently, I thought Batista had the Undertaker's number a couple of years earlier, but when he came up short, I figured the WWE had fully intended to keep the streak intact. The thing I like about Shawn being in the match was he was one of the few guys in the locker room who had a fighting chance of beating the Undertaker. The two put on an amazing show, pushing their bodies past the limit. With the other title match of the night being Cena vs. Edge vs. Big Show, the Undertaker and Shawn undoubtedly stole the show. One of the matches I was most looking forward to was the brother vs. brother contest between Jeff and Matt Hardy. I'm not sure why, but I felt like this one fell short of my expectations too. I think part of that was my shock in the outcome. I had really banked on Jeff winning and gaining some revenge on Matt. And of course how can I ignore my legends vs. Chris Jericho match. Regular readers know my love of old school wrestling, and since it was the Wrestlemania 25, it only made sense to have some old school players. Who better to fit that bill than "Rowdy" Roddy Piper, "Superfly" Jimmy Snuka, and Ricky "the Dragon" Steamboat? 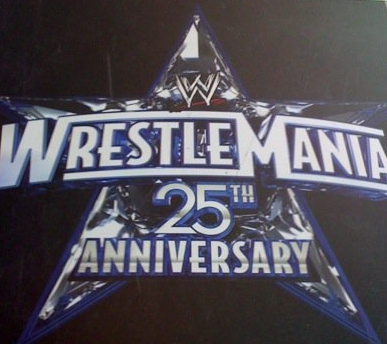 All three hall of famers were on the very first Wrestlemania card (Snuka was in the corner of Mr. T and Hulk Hogan). The only problem with using guys who were on the show 24 years earlier is that they're now 24 years older. 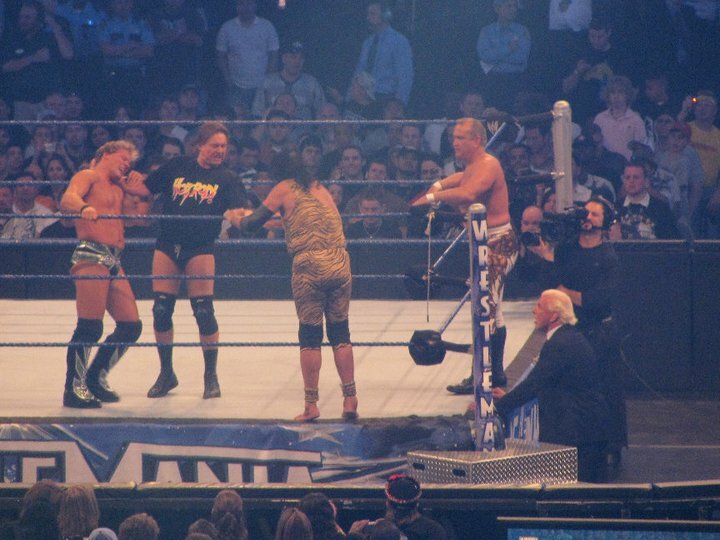 Their age showed as they plodded around the ring against the younger, stronger Jericho. Even with Ric Flair in their corner, the legends came up short, but I must say Ricky Steamboat really did look great in there. He had been retired for about 15 years at that point, but really didn't miss a beat. So like I said, even a not so hot Wrestlemania in person is pretty damn awesome. 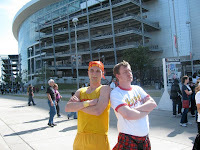 Oh yeah, I forgot to mention our costumes, as a tribute to the first Mania, Chad and I went as Hogan and Piper. And let me tell you after the show it was pretty chilly outside and I was running around in a tank top and shorts. Brrr. At least I didn't have the breeze blowing up my kilt though.